Veterans Council fundraising to prevent Veterans from becoming homeless and to provide free transportation to the Veterans Administration Hospital in West Palm Beach. 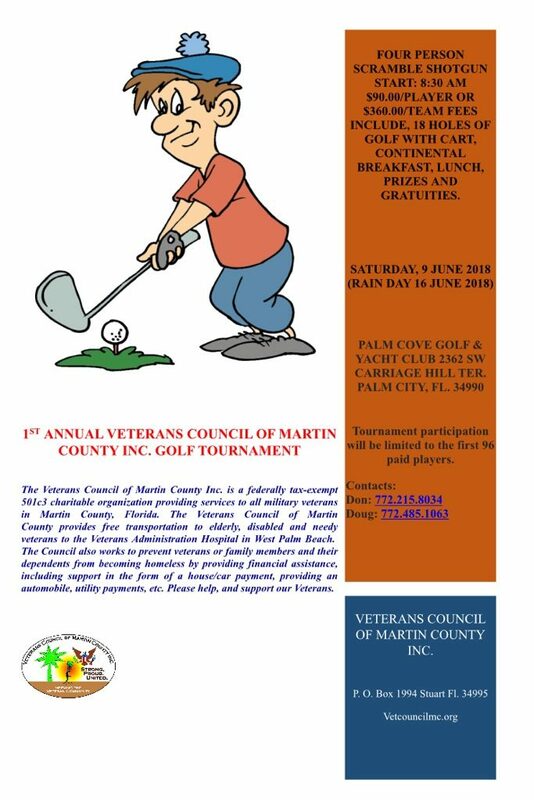 The Veterans Council of Martin County was established to prevent Veterans or family members and their dependents from becoming homeless by providing financial assistance and providing free transportation to elderly, disabled and needy veterans to the Veterans Administration Hospital in West Palm Beach. If not for the Veterans Council these veterans would not be able to visit the Veterans Administration Hospital for their appointments. The Council also sponsors the annual Memorial Day and Veterans Day parades in Stuart, FL. All members serve on a voluntary basis so 100% of the proceeds received by the organization go to helping Martin County Veterans. Fee includes: 18 Holes of Golf with cart, Continental breakfast, Lunch, Prizes and Gratuities. 2362 SW Carriage Hill Terr.